I am super satisfied to have the first of my three calendar pages done for September! The Craft Barn calendar prompts for September are Brown and Leaves, their weekly challenge is stamping and the Crafty Individuals September challenge is Anything goes... I'd say these are a perfect match for me! I wanted a "photo", a sentiment and embellishments for my page --and found all of them on CI-287. After picking out an 8x8 background paper with the brown and the leaves (DCVW), I coloured a piece of CI silk card with sprays in light blue and green. The trees were stamped in the middle so that I got blue for the sky and some green lower down. The remaining areas gave coordinating backgrounds for the sentiment, the birds and some punched out leaves. This will be a flip calendar, so the calendar grid for September will be behind the October page and can not yet be done. I have updated the August page with the grid I placed behind this one. Update: here is the whole "spread"... sorry about the poor light (and I believe the picture was in focus when I took it ?!?) I had set aside the piece with the month and some leaves when I made the page, so this was quick to put together. A very beautiful calendar Kristiina! Thank you very much for joining in the CI Challenge. 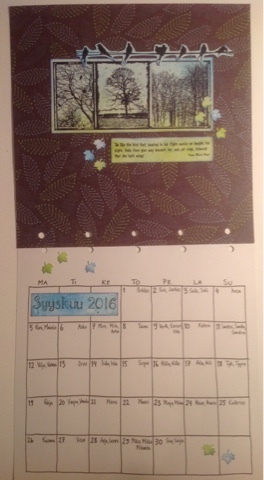 Beautiful calendar page Kristiina. Love the LO. Thank you for playing along with the Crafty Individuals Challenge. A great calendar page and I love that background paper too! This is such a beautiful calendar page. Thank You for entering your lovely artwork into the Crafty Individuals challenge. The paper matches the colours you used beautifully. This is a gorgeous page. Such a lovely page Kristiina, thank you for joining in The Craft Barn Challenge.